Titans 2-147 (Henry Davids 64, Jacques Rudolph 49, Dale Steyn 1-23) beat Sunrisers Hyderabad 7-145 (Shikhar Dhawan 37, Dale Steyn 27*, David Wiese 3-17) by eight wickets. Sunrisers Hyderabad scored 145 runs for the loss of seven wickets in the allocated 20 overs and Titans amassed 147 with eight wickets still intact in 16.3 overs. Henry Davids (Titans) was declared ‘Player of the match’ for his all-round performance in the game. The 12th match of the Champions League Twenty20 in Group B was played on Saturday, September 28, 2013, at JSCA International Stadium, Complex, Ranchi. Earlier, Henry Davids, the captain of Titans, won the toss and invited Sunrisers Hyderabad to bat first. 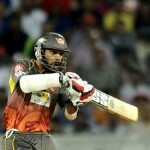 Parthiv Patel along with Shikhar Dhawan started the proceedings in an attacking style by scoring 12 runs in two overs. The latter hit 4 fours in the next couple of overs followed by 1 six and 2 boundaries in the fifth one. Patel repeated the same feat by hitting 1 six and 2 fours in the next over and they rushed to 62 in 6.3 overs when Shikhar Dhawan was gone for 37 off 21 balls with 1 six and 7 fours. Parthiv Patel went back to the pavilion nine runs later for 26 as the Titans bowlers started picking up the wickets at regular intervals. 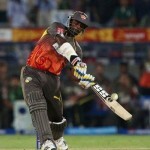 Sunrisers Hyderabad was 7-112 in 17.4 overs when Dale Steyn and Karn Sharma scored few quick runs in the remaining overs. Steyn was severe on Marchant de Lange in the final over and punished him for 20 runs with 2 lofty sixes and even fours. He held his end for 27 and Sharma was at the other end on 11 as Sunrisers Hyderabad managed 7-145 after 20 overs. David Wiese was the highest wicket taker with three whereas Henry Davids, Rowan Richards and Marchant de Lange shared one wicket each. Jacques Rudolph and Henry Davids started the chase bravely by scoring 39 runs in the first five overs with 2 sixes and 1 four from the latter. Davids continued with his onslaught and added another 3 boundaries in the next one while Rudolph came into his own by getting 2 lofty sixes and even fours until the end of the 8th over. 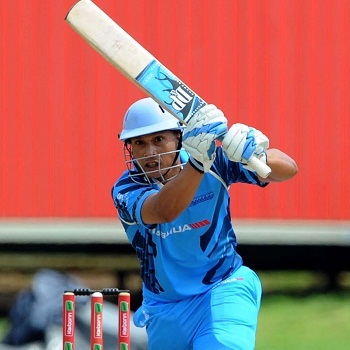 Henry Davids dispatched two sixes in the coming overs and powered his 14th Twenty20 fifty on the 31st delivery he faced. The score went past the hundred runs mark in the 11th over and Davids was caught by Darren Sammy at mid-off at the bowling of Dale Steyn for 64 from 42 mere balls with 4 giant sixes and 7 fours. The first wicket fell at 112 in 12.1 overs while AB de Villiers scored just nine runs and was replaced by Heino Kuhn. Jacques Rudolph remained unbeaten for 49 off 42 with 2 sixes and 3 fours, Kuhn was at his end at 15 as Titans piled up 147 after losing just two wickets and 21 deliveries remaining in the game. Dale Stey and Ishant Sharma were the only successful bowlers with one wicket each. Titans clinched the match against Sunrisers Hyderabad with a big margin of eight wickets and held two points.